When it comes to gratitude, I like to keep it simple. I spent much of my time in high school being hugely negative and feeling like my life was happening to me, not for me. In my defense, I moved states a month into my freshman year—from one of the most liberal places in the country to one of the most conservative—but I still could have dealt better. I wasn't taking charge. I was pouting and wallowing. I realized later how much of that time was mindset, and I started working harder to be better—more present, more positive, more grateful. My mom also forced me to read The Secret, which I can't say hurt anything. My gratitude practice went into overdrive after my dad died and I realized how short, how not guaranteed, our time is here. And I got more specific. During that time in high school when I operated like everyone was out to get me and the world was ugly, I made a list of all the goals I had for my future. I would love to read it now—I didn't know it at the time, but it was my first step to setting intentions. I remember writing that I would move to Seattle and I would get myself flowers at Pike Place Market once a week. The first job I had in Seattle was an internship at Seattle magazine. I had to walk through the market to get to it. 5ish years later, I had another job in the Market as the Social Media Manager for ChefSteps. If those aren't visions come true, I don't know what is. In retrospect, I've realized I put that magic in action. I put it into action years before it was actualized. Sometimes it can work really quickly, the magic. Sometimes it takes decades. I remember hearing a story about Jim Carrey having barely any money and writing himself a check for $10 million that he looked at every day. He'd also drive around LA looking at mansions and telling himself he'd live in one someday. Years later, he'd get a real $10 million check for Ace Ventura. I liked that story. So I got really grateful for what I had and I started thinking about what I wanted. I've turned it into a simple daily practice, and I want to share that practice with you. The steps are easy, but moving your mind back to gratitude when it shifts toward negative thoughts can be tricky sometimes. I don't always get it right, but I work hard to shift my thoughts when it's necessary. I certainly let myself vent and feeeeeeel the feelings before letting them go and moving again toward what I want instead of focusing on what I don't want. Because, as they say, you get more of what you focus on, and I want all the good stuff: for me, for the little family we're building, and for all of you. It's important to note, too, that focusing on what you want does not mean thinking about that you don't yet have it. It's about imagining yourself with it—with the adoring fans, the Montana chalet, the sold out arenas, whatever it is. That's the kicker. And it can be hard work to keep your mind right. I get it! I'm right there with you. Look at me. What a hippie I've become. What a half-country girl hippie I've always been, tbh. Honestly, I'm glad to be here. Herewith, a few of the things that help me live in gratitude, in abundance, in happy. It sounds simple, and it can be. But it can also be really, really hard. I remember growing up when my mom would always rephrase my complaints in a positive. She'd say things like "At least we aren't as mean as that person is. Bless her heart." I'd whine that she wasn't listening to me and to let me have my moment. I'd tell her she was being overly Pollyanna. And there is something to be said for allowing yourself to recognize the feeling you have BEFORE you redirect to the gratitude you can find in all things, even in the negatives. There's a delicate balance there, and I think I've finally found it. Mostly. But saying it, especially to others, is so helpful. Pretty much every day I tell Raz how grateful I am for him, for us, for our life. You can't really say it too much. I've been a huge fan of Oprah since I was tiny—I would come home from school every day, make a bag of popcorn, and settle in for her show every weekday afternoon. I ordered her Best Of DVD set and I still have it. I subscribed to O, The Oprah Magazine as a middle schooler. I am still ALL. IN on the all-mighty O. She's mentioned that one of her intentions in creating OWN was to go around the world finding stories of spirituality and telling the world about it. She wanted to be the Anthony Bourdain of gratitude. But she quickly realized we weren't ready (I am! But, I mean, I guess I'm not everyone ;)), so she created her Super Soul Sunday podcast to make it all more snackable. Sometimes I turn it on and listen while I sit and focus on breathing and I feel like a total zen master. The stories are great and the people are superstars. I just can't get enough. As much as I talk about gratitude, I'm pretty off the cuff about it and don't do a great job of writing it all down. 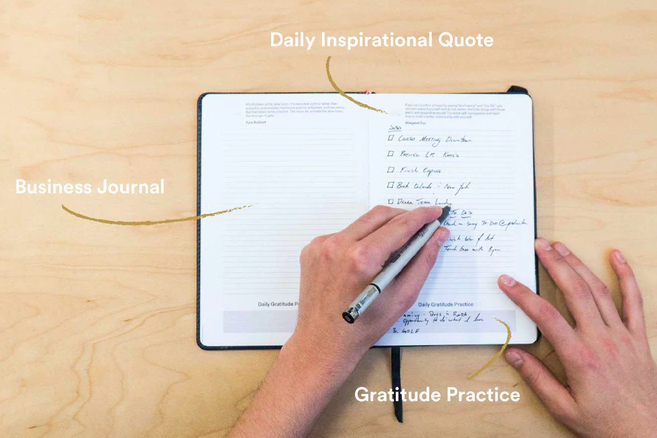 One of my favorite blogger's husbands came out with a Kickstarter for a daily gratitude journal and I love to support everything they do, PLUS I needed something like it, so I pledged and can't wait to start using it in the new year. The Mindful Notebook includes a gratitude section for each day, and listing the little things is going to be an easy, important exercise for me. Call it cheesy, call it weird, laugh it off, but vision boards are SO. FUN. I've always loved clipping magazines and making collages, so when I learned about visioning, I was alllll in. The philosophy I have with vision boards and similar "woo woo" things like them is Why not? It's not like it would hurt anything. For me, going through magazines and clipping photos to put on my board is something that gets me into a flow state. I used to keep a shoebox of magazine clippings growing up that I would use to make inserts in the front cover of my school binders. I'd only ever get the ones with a clear cover so I could slip in my pretty "BIO" or "ENGLISH" collages. Vision boards were an easy enough next step for me. This is my third year making one that I've hung up in our house. I tape them to the back door of my shoe closet, and for the most part, much of what I put on them comes true. I like to think they work because when I open that door to pick out my shoes, I make sure to take a beat and look at them. That way, what I've dreamt up through the imagery I put on them lives in my subconscious as I move about my everyday. I like to keep the old ones up, too, so I can look back on them and consider how they worked for me. It's fun, and pretty no lose. Once I get too many, I'll rotate them out just like they do with sorority composite photos, but I'll still keep them so I can look back and see how I worked to make all my dreams come true :). These are just a few things that work for me. I'd love to hear about the ways you live in gratitude, or fun practices you have.